The Union ‘reject’ unsolicited jersey concepts, upset fans in video. Sapong and Accam look to bounce back in 2019. 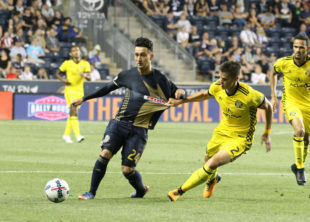 An article over at The Athletic looks at probably the best pickup game in the Philadelphia area, featuring professional players from around the region. Former Steel midfielder Adam Najem has joined the USL’s Memphis 901 FC. D.C. United was undermanned in the late stages of Saturday’s preseason opener, so in need of a substitute after making 10 changes at halftime, head coach Ben Olsen borrowed someone from second-division Bethlehem Steel for the last 10 minutes. On February 1st, reps from West Chester United appeared on an AM radio station to talk about their ongoing legal battle with Thornbury Township regarding their soccer fields. Temple’s men’s squad will face six teams this spring. New Jersey Youth Soccer crowned its boys NJYS Futsal State Cup champions over the weekend, where winners prevailed in the 12U to 17U age groups. Atlanta finally announced that they’re bringing on board center back Florentin Pogba. Sporting KC added Rwandan center back Abdul Rwatubyaye. Vermes continues to impress. . . .
Terrence Boyd signed with Toronto. NYCFC’s signing of Alexandru Mitrita is the third most expensive signing in MLS history after Miguel Almiron and Pity Gonzalez. How MLS and the Scottish Premiership became unexpected frenemies. MLS wants more corporate support from St. Louis as it ponders bid. Werder Bremen won on penalties to send Dortmund out of the German Cup. On the plus side, Pulisic scored for the first time since October, ending a 12-game goal drought. Son Heung-Min quietly becomes vital to Tottenham’s fortunes. Sports Illustrated ponders the question nobody was asking: What’s behind Neymar‘s pattern of poorly timed injuries? The Football Federation Australia cancelled a planned U-23s training trip to Thailand in support of Hakeem al-Araibi. Qatar is “running out of time” to honor promised labour reforms before the 2022 World Cup, says Amnesty International. Qatar won’t reform anything. There are thousands of labor casualties. Absolute travesty fifa will undoubtedly ignore. When it comes to fifa, it’s $$$ over anything. I hope 2022 is a big fat failure with terrible attendance and rotten football. Union fandom is a real rollercoaster. First, they ham-fistedly insult the fanbase with their moronic kit video. And then, less than 24-hours later, we appear to be on the cusp of making one of if not the biggest signing in club history. I feel like I’m constantly teetering on the verge of just giving up on the whole organization until they find a new ownership group. I read that Guardian piece on the MLS/SPL “frenemy-ship” this morning. Which league is best? It’s a great pub debate. I’d love to see a competition between top MLS and SPL teams. I think Atlanta might be the only team that could give the top 4 or 5 of the SPL a real run. And I doubt they’d fare well in any series against Celtic or Rangers. But I’d love to watch. Even if it were just a series of friendlies. I think if you don’t like the ownership group, you should give up until one comes along that you do like. Why stay in a relationship that only brings you pain? Of course there is no guarantee the next group will be any better or more committed. Sadly that’s the curse of Philadelphia sports throughout history. I remember in 1980 my dad telling me I experienced something his dad never saw in his lifetime. Makes you jealous of teams like Atlanta but then again Chicago started out better and seems they’re in the same boat as the Union now. Sometimes I’m envious of people who only like sports when the team is in the championship game and couldn’t tell you the name of anyone who’s on the team. It’s tough being a fan who cares to much. They don’t bring me pain… just consistent disappointment. I couldn’t possibly lay any claim to pain and suffering. This ain’t Sunderland.This club is my local club, but it’s only 10 years old. And I ‘ve only been a fan for six years. I honestly just want them to be competent and compete. I like the players on the team. I like Jim Curtin, even though I’ve often thought he deserved to be sacked. So far, I like Tanner. I’m just not convinced that the owners care even as much as I do, and I rarely get that excited about anything. And I won’t root for any other team in MLS. It’s Union or bust for me. It should be said that the people with a real claim on pain and suffering should be New England fans. 30th on the world in this report and they get an investment that would make it tough to run a USL team in Harrisburg.